There is no greater an influence on my imagination than the Star Wars saga. Throughout jr. high, high school, and college I always looked to the stories for a place of inspiration. Watching the making-of documentaries of the original trilogy and the individual ones we were given on the prequel DVD's over and over led to nothing short of a yearning to create my own universe. Needless to say, the Star Wars saga means a lot to me and in light of Episode VII - The Force Awakens opening tonight I've been re-visiting both the original trilogy and the prequel trilogy to get a sense of the universe I would be returning to once again. I was twelve years-old when I was introduced to the world of Jedi's, droids, and Darth Vader and now that J.J. Abrams is bringing most of them back to the big screen I thought a retrospective might be in order as I haven't talked as much about my love for the series on this site as I probably should have. Going into the The Phantom Menace in the summer of 1999 (yes, I watched the prequels first) I didn't know what I was in for and was transported to a world that very much spoke to everything I assumed the movies were supposed to be (yes, I enjoyed The Phantom Menace-don't act like you didn't). At that point in my development though, The Phantom Menace was mind blowing. I immediately went home and begged my parents to buy me the original trilogy. I officially became a Star Wars nerd at that point, but I didn't really care-it was beginning to become the cool thing anyway. I remained fascinated by the universe as I made my way through the original trilogy and though, by the time I was eighteen and able to finally see what Revenge of the Sith had to offer, I'd become slightly disappointed in where things had gone Sith was a good enough payoff to let things rest in peace. As that peace will now be disturbed though, I decided to take a look back at each of the six films that formed that galaxy far, far away. The original film, the one that started it all, the one that were it never made we would have none of the others (especially Empire). Of course, the introduction to this world and the film that changed the landscape of cinema from that point on while becoming a little more hokey with age is still a movie I could watch over and over. The chronicling of seeing Mark Hamill's Luke, ignorant of his past, yearn to leave Tatooine as he re-connects with Ben AKA Obi-Wan Kenobi (Alec Guinness) is especially spine-tingling if you were introduced to the prequels first. The initial meeting with Harrison Ford's Han Solo now feels like something of legend. The film moves at a perfect pace and connects the different plot points with just the right symmetry. It is the only film in the original trilogy that can stand on it's own. It is easy to see how original audiences saw this as nothing short of magical. Because of the stigma that surrounds it now, it is easy to get carried away with just how great the actual product is, but because it truly is enjoyable it more or less stands the test of time. It is a coming of age story that hits the necessary beats to be credible with both adults and children. It was the first film to portray a futuristic world as not being all sleek and shiny. It used old archetypes inspired by Joseph Campbell's Mythology and serials such as Flash Gordon and placed them in a wholly unique universe. Getting to the bottom of it, Star Wars was technologically innovative for it's time and created three lead heroes that audiences connected with. Now, it is a piece of history and even if it might not be the best or your personal favorite it will always be the one that started it all. With time, and in retrospect, it is easy to see why The Empire Strikes Back is most people's pick when it comes to deciding what the best Star Wars film is. After the success of the first film, writer Lawrence Kasdan and director Irvin Kershner were brought into to both punch up the script and lend the sequel a new visual prowess. The results are clear. Empire is the bridge between the first and third film while also being the darkest in terms of tone. Empire is segmented into very distinct parts and each section is a distinct achievement in all that is good about this saga. The war between the galactic empire and the rebellion alliance rages on and besides the grand opening battle on the snow covered climate of a planet in the Hoth system, we are introduced to Yoda as Luke travels to Dagobah. Han and Leia then escape to find refuge in cloud city as governed by Lando Calrissian (Billy Dee Williams). From the outset there is a more regal quality to the production. Beyond even the look of the film the story brings in so many new layers and complex questions that as enthralled as we are in the current world we also can't wait to see what happens next. It is intense to a degree none of the other films can touch. It is somewhat strange to think that neither the first installment or the final one don't resonate most with the fans, but instead this middle tale with an unresolved plot that. It is, in many ways, the gold standard for blockbuster sequels. Upon delving into the original series I initially thought of Return of the Jedi as my favorite. It had Luke going full on Jedi, Leia in the gold bikini and the simple advantage of being the final film in the series that would tie all the plot strands together. It would connect all the dots, tie up all the loose ends, and naturally offer plenty of thrills along the way. Too bad it also had the Ewoks...a lot of them. Like Jar Jar Binks, these furry little creatures offset the tone of the film and detract from the seriousness of the stakes between the Empire and the rebel alliance. I still enjoy the (maybe overly long) opening sequence as we find Luke back on Tatooine and looking to free Han and Leia from Jabba the Hutt. We know going in he will again come face to face with his father and in that is part of the issue with Jedi-it retreads too much of the same ground-pushing the narrative forward, but doing so in too familiar of ways. Jedi is by no means a bad movie and to this day I still enjoy it very much, but it is also the only film in the original trilogy that I would rank as equal or lesser than one of the prequels. Having watched Episode I before these Jedi is especially resonant for the layers of Anakin gaining perspective and glimpses of the man he could have been. This is where the discussion of watching order could come into play as watch Sith just before Jedi amplifies these themes all the more. Like I said in my opening paragraph, this was my introduction to the Star Wars universe and at the time it was thrilling. In many ways, it still is. While I understand the anticipation that was swirling around the film and the unprecedented expectations it was never going to meet, the backlash as well as certain factors the film does indeed fudge, have subsequently caused a culture of vitriol to remain towards the film. In hindsight I can certainly understand why people complained of Anakin being too young (though this fault shouldn't fall on Jake Lloyd) and of course that Jar Jar completely takes away from an otherwise very serious movie, but both of those factors were included largely for the sake of children and that it was mainly adults complaining about the film's shortcomings makes one wonder exactly who George Lucas was making these films for. This would mark the first Lucas-directed Star Wars since the original and as an introductory course to this universe it supplied a new generation with inspiration to seek out the history of what they had just experienced. So, if nothing else give The Phantom Menace credit for referencing countless of younger viewers to the original series. Still, there is much to like here. The pod race is as thrilling a sequence in any of the films and for my money's worth this film also features the best lightsaber battle in any of the films. Not to mention, Darth Maul. That this was the last Star Wars to be shot on film (until The Force Awakens that is) also makes it the only one of the prequels that really feels like a Star Wars film. As Lucas would get so obsessed with the technology in Episodes II and III spending less time with his actors developing their characters-the story and ultimately the aesthetic of the films would suffer. I can't hardly pretend to even like the second installment of Lucas's saga. This should have been the pivotal chapter, the one where we see Anakin show glimpses of change from innocent child to that of a disturbed young man who can't seem to find a balance between anger and passion. The film is plagued by Lucas's obsession with CGI and special effects and exposes his knack for writing horrible dialogue that plays awkwardly between two young actors who clearly have no direction for how they're supposed to play such scenes. Natalie Portman, while a good actor, struggles here and like Lloyd in Menace, Hayden Christensen has become synonymous with his less than stellar performances in these second and third Star Wars films. Ultimately, the advancement of the technology, the choice to shoot digital (in this case), and the amount of pure sheen on every surface and space character allow this to end up looking like a cheap space opera. Whereas The Phantom Menace still feels grounded in some kind of reality Attack of the Clones is like a poorly written, horribly executed bore of a film that was shot completely on green screen. The opening chase sequence through Coruscant seemed like a lazy excuse to infuse some excitement and the addition of a young Jango Fett seems unnecessary. The beginning of the Clone Wars and the epic final battle between the Jedi and federation droids in a Gladiator-like setting is a highlight, but it is all overshadowed by the wooden romance and rushed wedding of Anakin and Amidala or what is supposed to be the backbone of this entire prequel trilogy. No one will dispute the fact Revenge of the Sith is the best of the prequel trilogy. I certainly won't. As much as I don't mind defending Phantom I can't deny that this finale is easily the best of the series and that's undoubtedly due to the fact it gave us what we'd all been looking forward to. It has an overall darker tone and Lucas doesn't throw in any gags here to undermine that tone (unless you count Christensen's acting). The film solidifies that Ewan McGregor was the best thing about the prequels as his Obi-Wan Kenobi is the rock of which the original series grows from. McGregor serves as a credible talent that makes Lucas's dialogue sound common whereas everyone else hardly seems to know what to do with it. I'd hoped that Anakin and Amidala's awkward relationship might grow and develop into something more mature between Clones and Sith, but no. Christensen is simply never able to play the biggest bad of this entire universe as anything more than moody and bad-tempered and so it discredits all that has come before it. There are no facets to Anakin as represented here that make us fully understand his turn to the dark side. Though we get to see the physical transformation of Anakin into Darth Vader it never feels as earned as it could have been. That said, the final battle between Obi-Wan and Anakin was all we expected it to be with John Williams (the MVP of this franchise from the very beginning) score being more powerful than ever. While Sith is more or less a fitting addition to the Star Wars canon it will always be plagued by the idea it could have been better had Lucas cast someone else in the most pivotal role of all time. 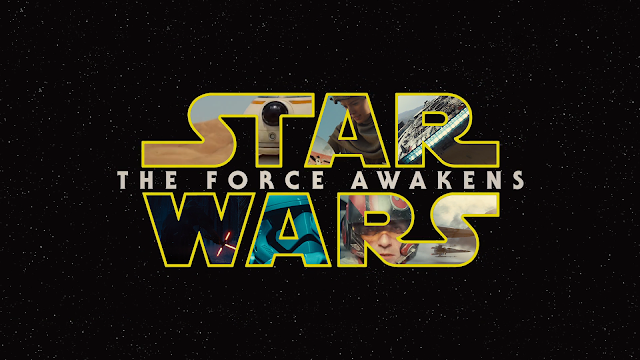 And now, we wait for Episode VII - The Force Awakens. Be sure to check back tomorrow for my full review of the latest installment in the Star Wars saga.